You know something huge is going down when the announcement of the newest iteration in the world’s biggest franchise is little more than a footnote to another event. That was the case today, as Activision and Infinity Ward helped to close the Xbox One reveal with the official first look at the next Call of Duty, Call of Duty: Ghosts. The next game in the billion dollar franchise shifts the story away from Infinity Ward’s previous Modern Warfare series, and introduces us to a new world. Ten years after the United States has fallen to an unnamed foreign power, the remnants of the U.S. Special Forces, including new members raised and trained under the new world order, are fighting back. The teams are known as Ghosts, and the globe-spanning, single-player campaign flips the script on the previous games. This is no longer a story about a world at war, it’s a story about resistance and rebellion. The script was written by Stephen Gaghan, the Academy Award winning scribe behind the films Traffic and Syriana. 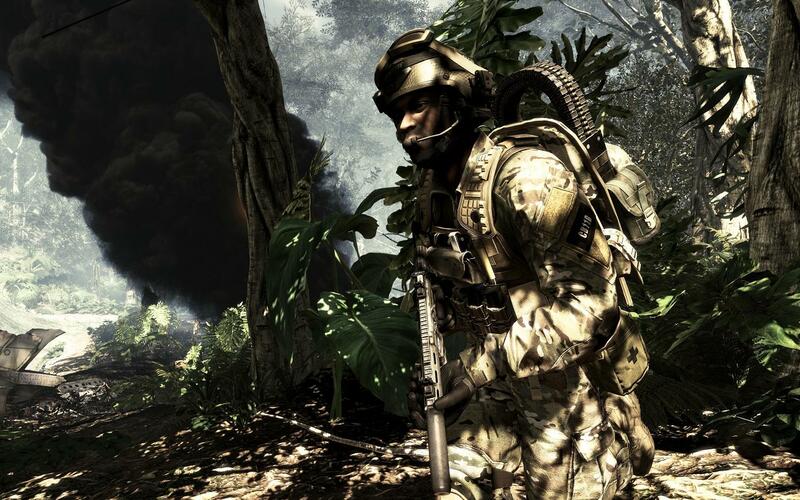 The story focuses on a single, as yet unnamed player that has grown up in this new world, which marks a shift from the previous Infinity Ward games that utilized multiple characters. The protagonist and his team will have access to some near-future technology, but for the most part they are cast in the role of the underdog throughout, so high tech tools won’t be at your beck and call. We haven’t seen all the weapons that will be available, but they will be more grounded in the modern technology, as opposed to Black Ops II’s future tech. One new addition to your arsenal is a dog – a very, very mean dog. Call of Duty has done dogs before, but never like this. The canine in your team will be a member of your squad, and will have several functions, from searching for items like explosives to attacking enemies. The dog is modeled on real animals used by SEAL teams, and, as with the characters in the games, the dog was filmed using full motion capture to give it a more realistic catalog of movements and actions. 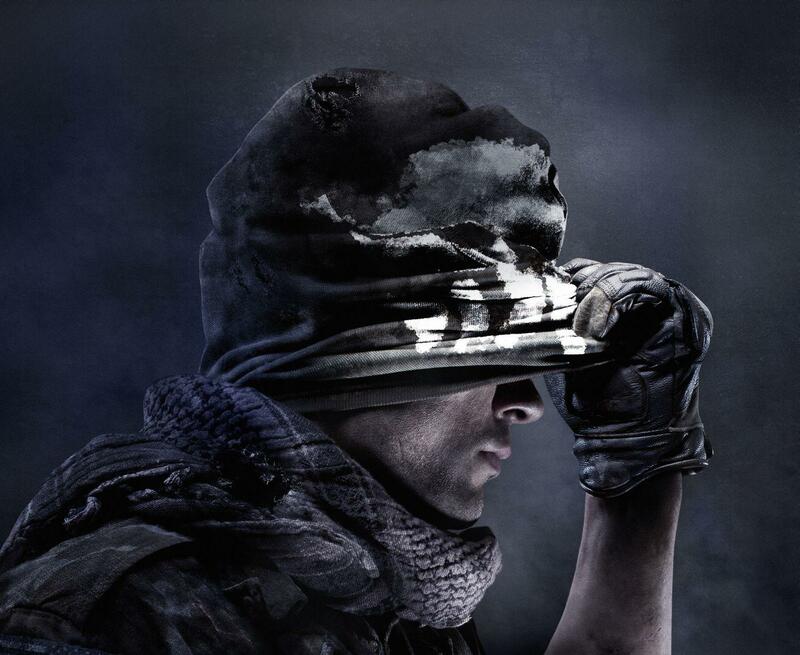 It is a part of your team, and teamwork is going to be a key to survival in Ghosts. Exactly how that teamwork differs from previous games isn’t clear yet. 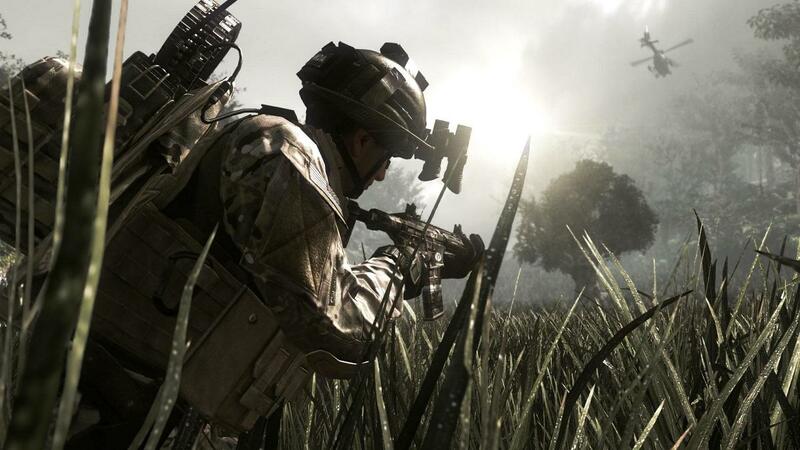 Ghosts will be on the current gen, of course, but its next gen versions help to highlight some of the differences between the two. To put it simply, the tricks developers use to fool you into thinking that the environments are incredibly detailed won’t be needed anymore, because the technology will allow them to flesh out environments like never before. For example, if you look at a rocky river bank running on the current generation of consoles, the rocks will generally be a flat, painted image. The colors will help create a sense of depth and texture, but it is a trick. The same river bank in the next-gen will feature individual rocks with their own height, color, and individual shadow. And it will do all this on the fly, meaning developers will be able to use next-gen tools to create this rather than programming each rock individually. These tools will help developers of all levels pull off some impressive graphics. You won’t need a $100 million budget to create a beautiful and immersive world. Many of the evolutions in the technology may not be apparent at first glance, but make no mistake, they are a leap in technology. 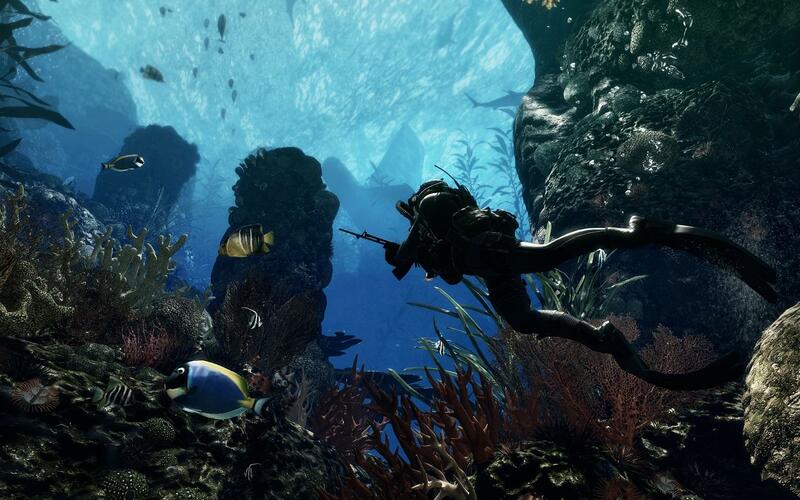 In a demo shown in LA last week, the protagonist and a teammate used scuba gear to infiltrate an enemy-controlled section of coast – beyond that, details were closely guarded. Along the way though, the new engine (which Infinity Ward is simply referring to as the “new Call of Duty engine”) showed some of the details now possible. As the main character swam towards a fish, that fish reacted and swam away. Bubbles from air tanks each had their own path upwards. 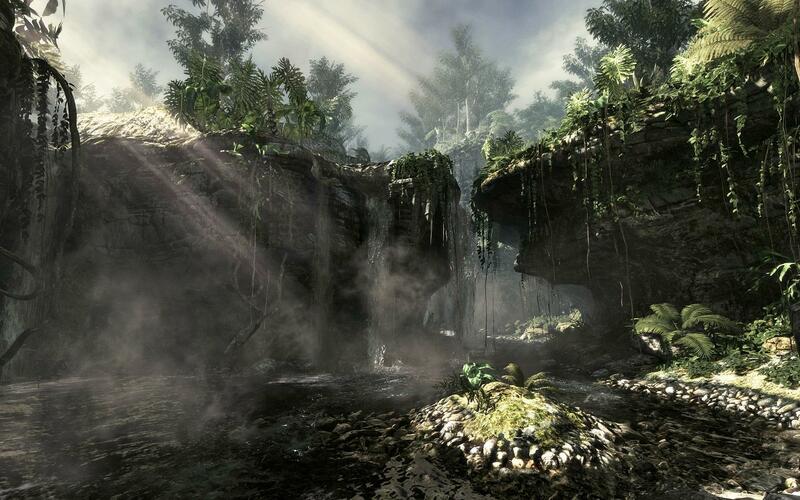 In another section of the game, a jungle was shown as a tech demo. Water reflects light onto walls as if through a prism, and going from a dark area to a sunny one will momentarily blind you as your eyes adjust. No one is going to go buy a new gaming console just because fish move independently, but when it all comes together the level of immersion is impressive. We will almost instantly take it for granted, but it is impressive nonetheless. The big question of what the Ghosts multiplayer looks like remains unanswered, but Infinity Ward did let slip two nuggets about the multiplayer. The first is that online avatars will be fully customizable. This is mostly an aesthetic change, and a long overdue one for the franchise. The other is more intriguing: dynamic maps. During a multiplayer game, a random event – like an earthquake or tidal wave – could alter the makeup of the map. Pathways could be washed away, or new ones could be created by the shaking earth. How and when these events are triggered isn’t entirely clear yet, but they will significantly alter the flow of an online match. All maps will also feature sections that players can alter themselves. This may mean you can use a grenade to open a previously locked door, or you can collapse a tunnel using a trap. We’ll have to wait and see if these truly alter the multiplayer experience, or if they are just a new trick players will quickly adapt to. During the Xbox One presentation, Activision also confirmed that the multiplayer DLC for Call of Duty will still be a timed exclusive for Xbox users. Expect more on Call of Duty: Ghosts at E3 and in the months after, all leading up to a November 5 release on PC, PS3, PS4, Xbox 360, and Xbox One. A Wii U version has not yet been confirmed.